Tomato seeds are some of the easiest seeds to save, so they're a good crop for beginning seed-savers. They're easy primarily because seeds don't need dry weather to mature well, and because the recommended isolation distances are smaller than for most other crops. There are also plenty of exciting varieties to be found. We've made this page more detailed than most beginners' guides, in hopes of answering any lingering questions you might have. The techniques described here are also applicable - with a few differences - to a range of other seeds that mature wet, like eggplants, tomatillos, squash, and melons. For a review of the main differences, see our Basic Guide to Seed-Saving. Isolate your home-use tomato seed crop from other tomato varieties by at least 10 feet (for modern varieties) or 35 feet (for heirloom varieties). This way, bees and other pollinators are unlikely to carry pollen from another variety to your seed crop. When we grow for commercial sale, we have higher standards of purity; on our farm, we isolate our tomato seed crops from one another by at least 150 feet. 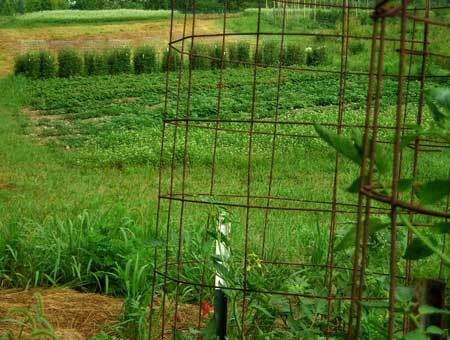 At right, leaves and cages of Old Virginia tomatoes are in the foreground while Red Pisa Date tomatoes are in the background, just in front of the bean trellis arch. Uncaged Rosella Purple tomatoes are on the crest of the hill, near the top right corner of the photograph, though at this resolution the Rosella Purple is not visible. Alternatively, you can bag a little bunch of buds on one plant until those buds become immature fruits - but we won't go into the details of that method here. If you don't isolate the varieties, bees and other pollinators may take pollen from one variety to another, resulting in seeds that have unpredictable mixes of genetic material. Commercial growers and some home gardeners would not like this unpredictability, but other home gardeners might delight in it. 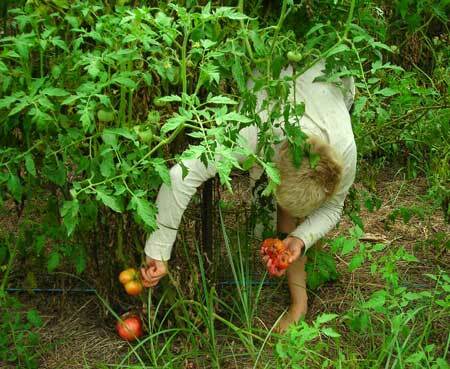 Pick your tomatoes when they are very ripe. 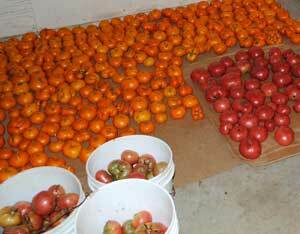 Overripe, stinky, and split tomatoes are fine, though we always try not to use any that have black mold. Tomatoes reach seed maturity at the same time as maturity for eating. (However, in some other kinds of fruits, the seeds would still be immature at the eating stage.) 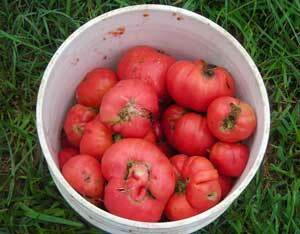 Using under-ripe tomatoes is likely to reduce the germination rate of your seed lot. At right, Julie harvests Radiator Charlie's Mortgage Lifter tomatoes for seed. If you've picked some tomatoes that you think might not be fully ripe, you can let those ones sit around for a few days to ensure full ripeness, as shown below center-left. Mash or blend the tomatoes. Cutting them in half and/or coring them first may make this easier--especially if you're working on a small scale and if the tomatoes are large. 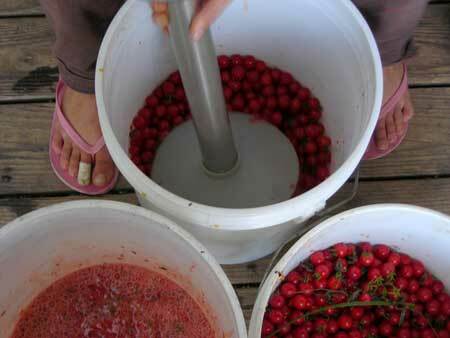 Above center-right, Julie uses an immersion blender to blend three buckets of Matt's Wild Cherry tomatoes. Alternatively, you can scoop out the seedy, watery inside part of the tomato and keep the outside part for eating. This is much more time-consuming, but works well with varieties that are bred for canning or drying--the outer, fleshy part of the tomato has much less moisture in it than the inner juice around the seeds, and when you're canning or drying, it's great to start with a lower-moisture product. 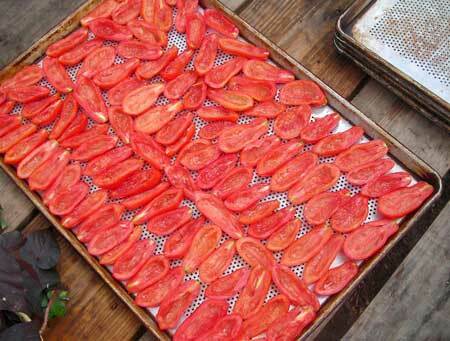 Above right, de-seeded San Marzano halves are laid out on an oven tray for drying with the use of the convection oven fan but with almost no heat. (We only put the heat on the lowest setting for a few minutes, then turn it off and leave the fan on). Ferment the seeds and pulp by letting them sit for 2-3 days in a container labeled with the variety name and the date you start the ferment. Keep it covered so that flies won't get in--but if some do get in, don't worry. To avoid buildup of pressure, it's better to choose a lid that's not airtight. 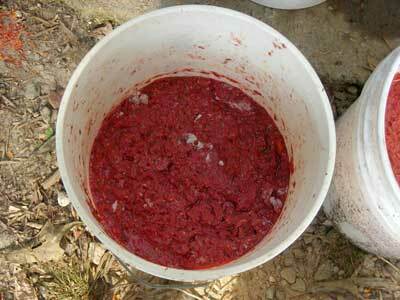 It's also a good idea to stir the seedy mixture every 12 hours or so, mixing in any mold that forms on the surface. (More stirring won't hurt, and even if you don't stir, most of your seeds will probably still be fine.) 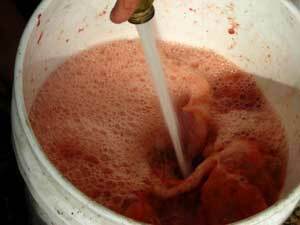 If it's hot the fermentation process will go faster; people in the tropics generally ferment their seeds for less time. Fermentation makes sense because the wild ancestors of tomatoes (and many other plants) evolved to reproduce when their fruits rotted on the ground. By fermenting them, we create a similar, though more uniform, process, If you see sprouting seeds in your mix, you've probably fermented it longer than is best. 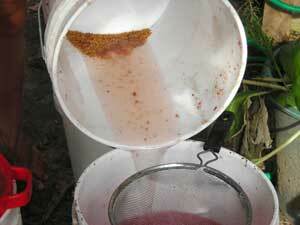 The tomato pulp and seed mixture at right has been fermenting for 3 days and is ready to clean. 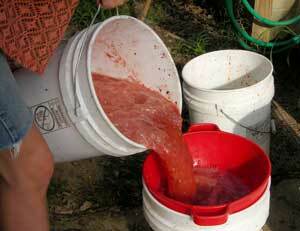 Add water to the seedy, pulpy mixture. High water pressure can help to dislodge seeds that are still stuck to the pulp. The good seeds will sink; seeds that float in water are generally not viable. Below left, Julie adds water to a bucket of fermented seeds, using a quarter-turn shut-off regulator to produce high water pressure. Pour off most of the pulp, leaving the sunken seeds in the bottom of the container, along with some water and some pulp. Continue adding water and pouring off pulp until you've removed most of the pulp from the container with the seeds. Strain the seeds. A tea strainer works well for small seed lots. Above center-right, Julie gets ready to use a large kitchen sieve to strain the seeds from a bucket of tomatoes. If you pour the pulp into a strainer, bowl, or bucket as shown above center-left, you'll have the option of adding more water to it. This can generally dislodge more seeds, though the bulk of the seeds will already have been separated out. When we work with large lots of tomatoes, we get enough seeds out of this step to make it worth the time. Let the seed dry out of direct sunlight, but with good air circulation, for about 3 weeks. Shorter drying times can work, but by erring on the side of a long drying time, you'll be more sure that the seed is fully dry. Small lots of seeds can be dried on paper, on screens, or wrapped in cloth so that you can hang them up. If you have a large amount of seed, take care to spread them thinly or hang several small bundles. 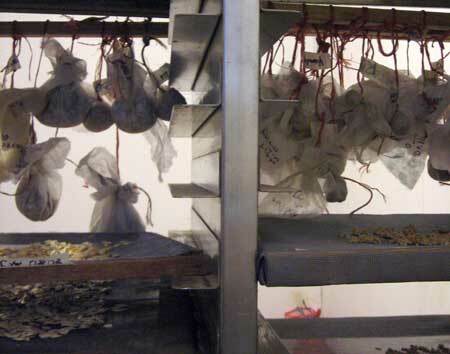 At right, small lots of tomato and pepper seeds hang from a shelving unit while larger lots of tomato and squash seeds are spread out on wire mesh shelves. Store your seeds in well-labeled containers in an cool, dry place. An airtight container in the freezer works best for tomato seeds and for most other seeds. Include the year of harvest, the variety, and any other notes you find useful.